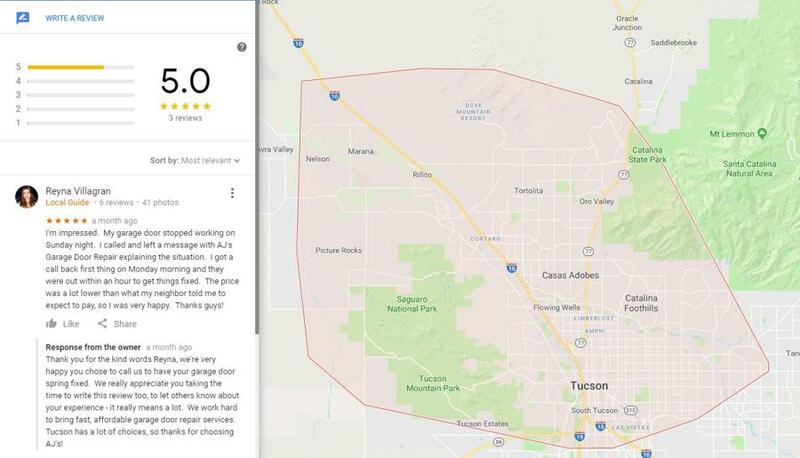 Southern Arizona based AJ’s Garage Door Service of Tucson is pleased to announce that they recently received more positive feedback from one of their clients regarding their garage door repair services. AJ’s Garage Door Service is a local company that offers garage door repair services to the residents of Tucson and Oro Valley, Arizona. 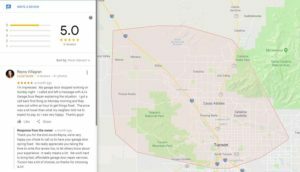 According to their GoogleMyBusiness website, they provide personalized repair services and competitive pricing to the community. They also take pride in using Arizona-made garage door springs and spare parts to contribute to the growth of the local economy. “We offer maintenance, repair, and supply of replacement parts for residential garage doors in Tucson and the nearby areas. During site inspections, we thoroughly assess all of the mechanical parts and salvage the ones that can still be reused, so that homeowners will not be forced to buy anything that they don’t really need,” says Andrew Johns from AJ’s Garage Door Service of Tucson. According to Johns, the company offers professional repair services for all types and brands of residential garage doors. They specialize in fixing mechanical parts such as broken springs, tracks, and pulleys. In addition to this, they provide garage door maintenance and new opener installation as well. “If you feel like your garage door is not functioning as it should be, just give us a call and our technical team will answer all your questions. Tell us what’s going on and our top-notch technicians will get to your house and fix your problem in no time,” he added. Johns also highlights the importance of proper and regular maintenance of your garage door and its mechanisms. A fully-functioning garage door primarily provides safety and security. Regular checking and maintenance of garage doors also offers more financial benefits to homeowners in the long run. “Common problems relating to garage doors can easily be fixed. However, if you keep on ignoring them, it might cause the whole system to collapse and result in heavy repair expenses,” he said. Generally, proper garage door maintenance includes tightening of nuts and bolts, lubrication of mechanical parts (bearings, hinges, and rollers), adjustment of the door opener and springs, tightening of chain, setting of limit switches, and lubrication of the entire drive mechanism. Furthermore, should homeowners decide to sell their property, a repaired garage door is a positive factor in the estate’s market value appraisal. During property viewings, prospective buyers scrutinize every part of the house, and having a fully-functioning garage door can leave a better impression on them. Those who are looking for a reliable garage door repair and maintenance company in Google may consider AJ’s Garage Door Service. They are considered one of the top service providers in the area, based on their positive reviews and recommendations online. Those who wish to keep in touch with the company’s latest news and updates may check out their Press Release media page here. Interested parties may also visit AJ’s Garage Door Service’s official website to learn more about their repair and maintenance services.